1803 "In the latter half of the 18th century Mary Wray - wife of Daniel Wray (1701-83), distinguished antiquary, man of letters and trustee of the British Museum - attained a proficiency in the art of cutting silhouettes which equalled that of many professional profilists. When the vogue for silhouettes was at its height many people enjoyed the hobby of making shadow portraits in their family circles." Land, Garden, Orchard, Coach-house and Stabling. 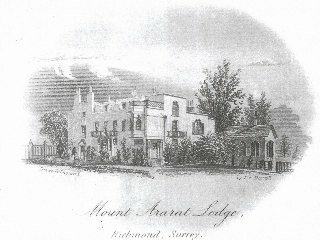 A MOST desirable COPYHOLD FAMILY MANSION, pleasantly situate on a gentle eminence at Mount Ararat, Richmond, Surrey; the property and late residence of Mrs. WRAY, deceased, rich in luxuriant prospects extending to Harrow, commanding the view of the Pagoda at Kew, and encompassed in part with a few noble elm trees, standing for 2 carriages, stabling for 8 horses, lawn, pleasureground, laid out in walks, planted with choice shrubs, an excellent kitchen garden, a considerable range of walls cloathed with full-bearing fruit trees, gardener's cottage and orchard; comprising in the whole 3 acres, part freehold; together with near 3 acres of profitable pasture land, immediately opposite the mansion, held on lease. The Dwelling contains a spacious entrance hall or summer eating room, bow-windowed parlour opening with folding doors into a small library, excellent staircase, noble lofty drawing room 13 feet high, 26 feet in length, and 20 feet broad, bow-windowed sitting room, 2 principal bedchambers, a dressing room and water closet, a back staircase throughout, with 3 family bedchambers and 5 servants rooms on the upper story, and various conveniences. The Offices consist of housekeeper's room, butler's pantry, kitchen, larder, dairy, scullery, laundry and wash-house, complete with cellars and drying ground: a coach sweep approach, inclosed by gates, leads to the dwelling. 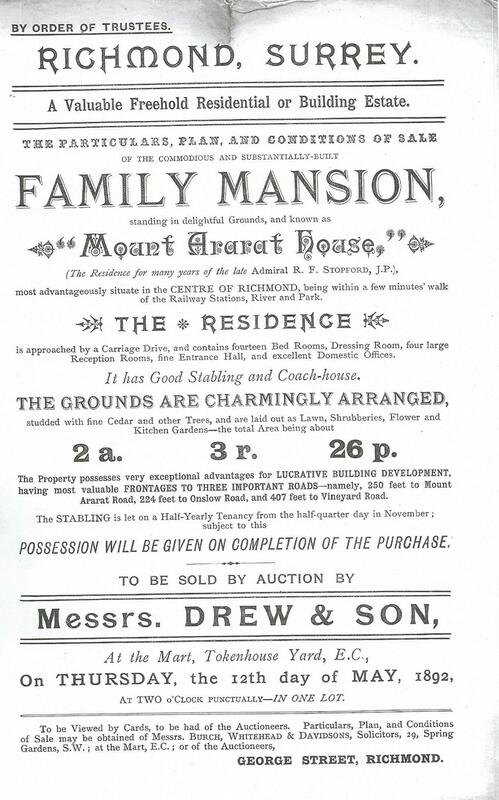 May be viewed by tickets only, ten days preceding the sale, on application to Messrs. Peter Coxe, Burrell and Foster, Throgmorton Street, of whom particulars may be then had; and at the Star and Garter, and Castle, Richmond; and at Lloyds and Garraways. Richmond, Surry. Household Furniture and other Effects. THE HOUSEHOLD FURNITURE, Books, Electrical Machine, Clock, exercising Horse, with other Effects of Mrs. Wray, deceased. The Furniture comprises mahogany library, and other bookcases, writing table, double and single chests of drawers, wardrobe, lady's dressing table, dining, card, and Pembroke tables, sideboards, a number of four-post bedsteads, with cotton, dimitry and stuff furnitures; goose feather beds and bedding, window curtains, pier and dressing glasses, japanned and other chairs, Turkey, Brussels and Kidderminster carpets, lustre candlesticks, china and glass, kitchen furniture, with various other articles. 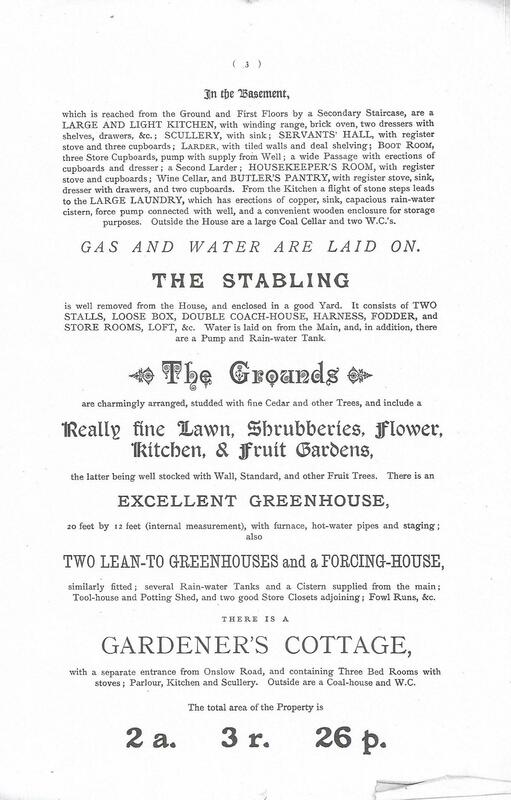 - May be viewed on Saturday preceding the sale, when Catalogues may be had on the premises; the Star and Garter, and Talbot, Richmond; the Red Lion, Putney; and of Messrs. Peter Coxe, Burrell and Foster, Throgmorton Street. 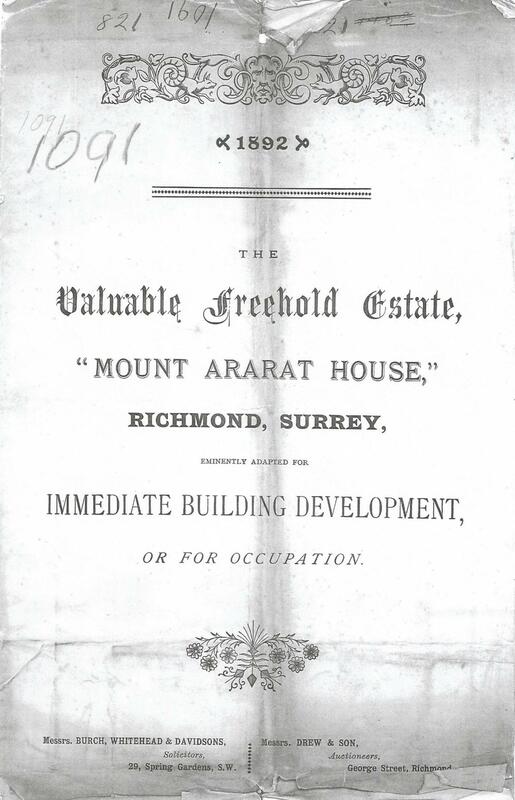 1842 Driver map labels the building as Mt Ararat. 1841 Census: Mount Ararat House occupied by Henry Hawkes, of independent means, and his family. 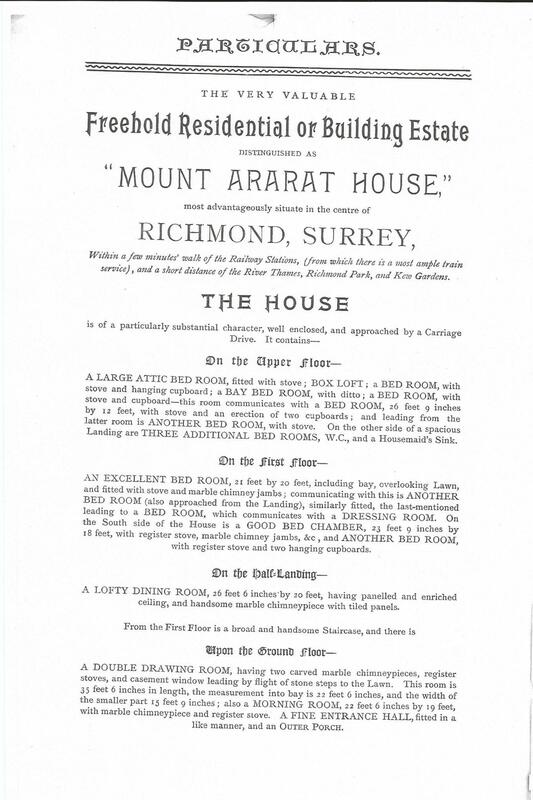 Part of the house was used as Mount Ararat Lodge School. 1851 Census: Anna Grosvenor, Fundholder, and 12 servants. 1861 Census: Anna Grosvenor and 6 servants, plus her visiting sister with 2 accompanying servants. 1865 Map shows nicely laid out garden with a fountain. Mount Ararat road is named as such. 1913 Map shows the house pulled down and new housing covering all the previous house and garden. The new houses on The Vineyard number 47 - 77. They were built before the census of 1901.